Obviously writing in detail about all of that would probably take a whole book. Some fundamentals are required like being able to analyze your players, the trends in your leagues, which types of teams you’ll play often against (from a strategical, not necessarily tactical point of view) and how to connect all of these aspects to a system. Sir Alex Ferguson or also Claudio Ranieri now have created a successful system partly because of specific patterns recognizable in the league and thus utilizing game theory to their and their players’ advantage. Another thing is the ability not only to coach this from a methodological point of view (incl. man management, didactics, etc. ), but also in terms of understanding your players. I have done some work about this in my webinar on Inspire! and in my German book “Fußball Durch Fußball” (translated as Football by/through Football) together with Marco Henseling. 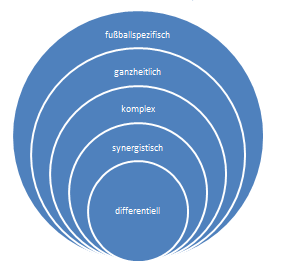 Also recently I wrote an article for the coaching magazine of the German FA on how to create an opponent specific match plan. Still, the question mentioned at start always pops up: How do I make a game model for my team? Thus, I want to give a small example on this. Perhaps the most important thing is to decide which things are non-negotiable for you as a coach and which are flexible. Normally I do create my system, both as a coach with my amateur team or as an analyst / consultant, in regards to the players I have at my disposal and the league we play in – because this will deduce on how many training we have, which level we will have physically, technically and tactically but also how the opposition will normally play. Then I / we adapt them towards the opponent on a weekly basis. Still, there are some aspects I consider most important and thus I will look to introduce them into my team no matter what – at least as a coach. Man or zonal marking, pressing, counterpressing, compactness, positional play and ball oriented movement out of possession, short passing, etc. could be such things; nevertheless specific aspects of this can be varied in detail if the players have specific strengths or weaknesses. When I took over a team that played man marking, I did look to introduce zonal marking but let them play a variation of zonal marking which allowed them to man mark in their zone. This is used by Dieter Hecking similarly and the literal English translation would be “zonal man marking”; everyone man marks but just in the zones that belong to their opposition. As most teams don’t overload or change positions in an organized way in this league it worked fairly fine. Thus, they had their typical orientation but did not leave gaps as open as in man marking. Man Marking vs Zonal Man Marking (or: Man Marking In Zone). On the left you see a player tracking his opponent even away from his zone. On the right you can see the same player tracking his opponent until the outer limits of his zone and then leaving him to his team mate who steps up. There are endless variations of this, though (some do it off the ball, some only near the ball, different switches of who moves up, etc.). I did this also because of other external factors: Due to lack of training time on this level I would not be able to introduce a clean and well executed zonal marking so I first did this before I would later leave it for a proper zone. The other possibility I contemplated was to let them play a very strict zonal marking where the extremeness of it (similar to Villarreal or Gladbach) would help me to change their mindset faster as the message was clearer and later on introduce a more variable variation; I decided against this way due to the players. Also I looked at playing a positional style of play – look up Adin’s article on our site or Kieran Smith’s great presentation on Inspire for more information on Juego de Posición – which worked well in the first season but only in the first two thirds; in the last third the team just had players who are more suited to a chaotic, dynamical style which lead to us building up in something akin to Juego de Posición and then playing more ‘messy’ in the last third and even before that. After some of the players left, we changed to a different style in possession which did not have much principles of Positional Play anymore. Example of an asymmetrical 3-4-1-2 I used with an earlier team of mine. Thus, it’s important to clarify which things you want to see and which things you could adapt how. Not only your squad is important, but the whole context of the league. Different cultures, levels and leagues have different patterns. Some leagues vary a huge amount, others have teams playing in very similar systems. Let’s go back to the previous example: In Austrian lower leagues until a certain level most teams either play a 3-4-1-2 with man marking and sweeper or a 4-4-2 with a mixture of zonal marking and man marking (wings in the back four as man markers, central midfield players too). Thus, when building the game model it’s important to reflect what this means tactically and what the strengths and weaknesses of the oppositional systems are. This is not focused just on the formation; it’s much more about the movement and patterns these teams use. 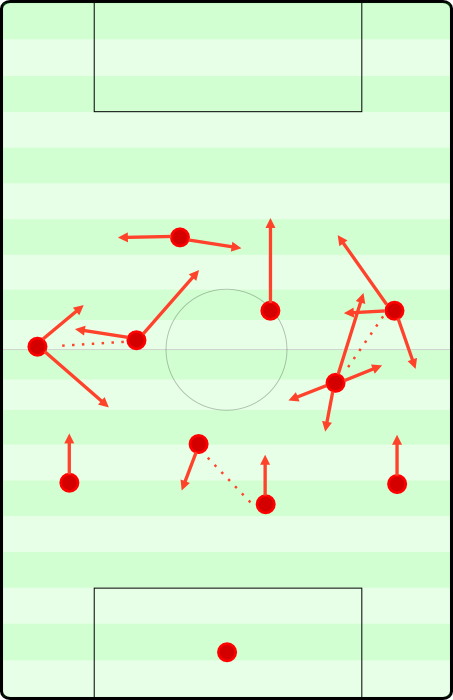 One example from the EPL are the positioning and passes from Fuchs and Albrighton paired with Vardy’s movement at Leicester; they lure out the oppositional wing and full back and then play long diagonals in behind after Vardy runs horizontally and then into deep, which attacks specific marking and movement aspects of EPL teams. Also it uses Vardy’s ability quite well. The left winger occupies the right full back, the left full back has now a gap to play a long ball. Vardy can either run directly in behind or run horizontally and then into depth, depending on communication of the players marking him, the gap, what Fuchs does on the ball and things like when eye contact occurs between them. If your opponents are mostly playing man marking, you should teach your players (first) how to play against man marking, how to read man marking schemes and how to behave individually and collectively against that. The same applies for zonal marking, of course. 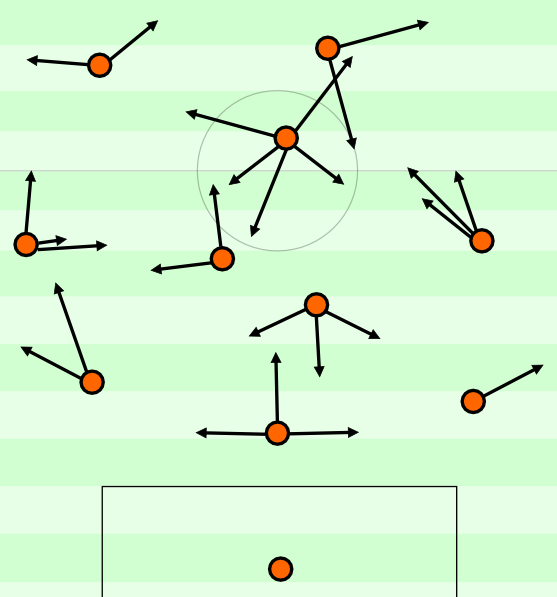 For instance, some coaches use as guideline against zonal marking to position in behind the oppositional pressing line and move out of the cover shadows of the players in these lines. Others like to put their players in one line with the opposition so they can turn into more space. And some put their players into the next line of the opposition to play with lay-offs after long verticals – sometimes on purpose to players behind oppositional players so they can feel where the pressure will be coming from. In all of these situations the first decision for the player getting free is if he’ll run into the gap or if he’ll already be positioned. The first decision helps him in terms of visual field of opposition who either don’t see him or have to lose eye contact to the ball carrier. In the first picture left he drops and receives between opposition, so he has more space to turn into. In the second picture he goes into depth, so he can either break through or lay it off to his team mate – who is positioned in a way that if he gets pressed he can get his body between ball and opponent most easily. In the latter he moves centrally in between these four which gives them a tough decision who will push out to press (or if it will happen). So depending on the tactical goal and the coaches’ preference for his players the exact position will vary. Read your opponent! Does he follow you if you move higher? If you move deeper? Be active and try to create distance. It’s important to look at such reoccurring aspects from many perspectives and in many situations to optimally use them. In the end it’s the most important to create a suitable system for your players. Which players are success stable when and act well in which situations? Where not? How do the synergies between players look like? Could they occur more/better in other situations? Can we create these situations consistently? If so, how? Which aspects of their play am I realistically able to coach and enhance, which not? This is an art in itself. Finding out how players act together is hard, especially when experimenting with new schemes, systems and so on. Culture and age is also important to note for training and the application of these aspects. To show how this might look, I will create an hypothetical example so it’s more understandable. Especially in lower levels it’s hard to find a team where you can use symmetrical shapes; even if you try to most don’t play symmetrically. To utilize the potential to the fullest, it’s often required to play a bit asymmetrical. In this case the 3-2-4-1 in possession has a slightly lopsided diamond in the middle and will become a 3-4-2-1 and perhaps even a 4-3-2-1 or 5-2-2-1 out of possession. For simpler explanation in our hypothetical training we will pair some players which are interacting in a specific way (positional changes and balancing movements) with each other. I like to use these pairings because it simplifies orientation on this level and will come handy in something I will mention later on, too. The left holding midfielder will be paired with the sweeper; when we get pressured he should act in the middle as option for passes and to distribute while he can drop between the left side back and the central back. This in turn allows the side backs to become full backs and push forward. We then either have two wings on each side or the wing backs can move towards the middle. Our next pairing is the right holding midfielder with the right wing back. They should not move to far away from each other, hold positions and change them in specific situations; especially prior to a switch from the left side or in more passive situations with good marking of the opponent (obviously the cues and triggers can be much more detailed and frequent). The left central midfielder is paired with the left wing back; here the asymmetry occurs. While the two holding midfielders are in one line, they are paired differently thus one of them will drop more frequently deeper (if we train it correctly and properly) with the other moving more often towards the wing in the second or third line of our nominal formation. The left central midfielder is positioned higher in the basic build up but has similar movement with the wing back on his side while the right central midfielder is free to roam, to move deeper and support there, to build play in higher zones or act as second striker. Our striker upfront on the other hand is instructed to move towards the sides with a tendency to go more towards the left; he can interact with the players there and opens space for our free player on the right side of our central midfield / “top” of our lopsided diamond. We can also change our pressing fairly easily against the teams in this league. If the opponent has a 3-4-1-2, we let them build and then advance aggressively after a sideways pass. If their player in the first line is very wide, our wing back will advance to press him – the central players move towards the ball and cover these zones. If their player in the first line is narrow, our central midfielder will advance to press. If they build up with a back four we can make similar schemes or create a 5-4-1 if we want to go more stable; with a high pressing line and compactness but without pressing upfront at first. The problems could lie in counters and presence in the last line which is why the movement of our right central midfielder and our wings will be of huge importance. Without wanting to go into too much detail: The wings and/or the central midfielder on the ball far side could already position them a bit higher and the centre forward moves towards the ball side so we have possibilities to counter and compensate the lack of players in the last line out of possession a bit. Now the obvious question is: How do we coach this? Besides the sessions and the methodology it’s important to create easy instructions and guidelines for the players that we can use. If the central back / sweeper is supporting near the ball, move away. Position yourself in the gap between the center back and side back just 20 meters deeper. If the central back / sweeper is supporting away from the ball, move towards the ball. Offer yourself for a simple back pass. When you receive, try to already face where you want to pass next. Check your surroundings always. If you don’t find a passing option, go long towards the sides. Use hand gestures: If you have space in front of you, show with your hand you want the ball in front of you. If you are not sure, point with your hand towards your feet. If the back line advances, advance with them. Keep 20 meters distances to them but always be active. Try to intercept long counters behind the back line or prevent them by helping your team mates. If the ball position changes in the oppositional half – no matter who has the ball – move towards the ball. Don’t position yourself with the side backs in one line in possession. If you do that, you cut their connection and make smaller space. Try to be a few meters deeper. Imagine a diamond or pentagon with the side backs and central midfielders! With this, the opposition needs to cover more space in pressing. If you get pressured from the side or don’t get pressured at all and there is space in the midfield in front of you, you are allowed to advance. If you feel our build up is too passive, move towards the right a bit and instruct the left holding midfielder to drop deeper. When passing to the side, always look diagonally behind you after that. You should check if there are players in the passing lanes to the other side back for switches and if the middle is open for passes there if you should get the ball back. If you face the whole field, look for diagonal passes towards the wing. There we have the positional switches and can get a free man with dynamical superiority. If the Central Back advances, check if one of the central midfielders is dropping. If not, move 10-15 meters towards the middle to create a back two for cover. When we get the ball and secured it, immediately split and make the pitch big. Don’t position yourself in a horizontal line with the central back / sweeper. If there is space in front of you, you are allowed to advance. If there are two players in the middle – as in a midfielder dropping deeper – you should advance forward. Before receiving position yourself so you face the central spaces and always try to look towards the highest midfielders so you have the most information input for your possible passes. If you play it to the wings, try to do it directly! You are allowed to position yourself in a line with the central midfielders but only if there is still an open passing lane to your central back and you are not too near to the wing back in front of you. Only move towards the middle when we have possession if you think we will lose the ball soon or your support in the middle is the only option to stay in possession. Otherwise stay wide. If the central back advances, move towards the side to open space. Move backwards so you still have an open body posture towards up front. Look around you so you don’t get pressured from behind. If you don’t find space in the middle, drop deeper so the side backs can become full backs. Try then to either find them or the central midfielders. Don’t move too far to the sides. Always stay in front of the gap between the central back and the side back. Only move to get free and to escape oppositional access. Turn if there is a vertical or diagonal pass to the players higher than you; you should be able to receive lay offs from them and then distribute forward again. Try to have an open body posture towards the right side; with this you have a good overview of many players and can also distribute it long. Don’t initiate positional changes with the right wing back if you are potentially able to receive the next pass. If you feel you won’t get the ball and can’t get free, you are free to initiate positional changes with the right wing back. Don’t be in one horizontal line with the right wing back. Try to be in a line between him and the right side back. If you pass to the middle, look toward the right side to see what your partner is doing. If he gets a pass (especially from you), immediately look towards the middle so you know where you could pass to if you receive it back immediately. Never be further away from the right wing back then 20 meters, except your partner in central midfield has dropped deeper. Then move towards the middle to occupy the space in front of the gap between him and the central back / sweeper. One great situation to change positions is when we circulate on the opposite side and pass it back. Now you can move towards the wing and he can advance into the middle. Look at your partner and create eye contact when changing position! You are allowed to advance through the middle and towards the oppositional box, attack open space in front of you if you see it. Look at your partner and create eye contact when changing position! One great situation to change positions is when we circulate on the opposite side and pass it back. If you feel you saw open space in the middle and you are not able to receive this or the next pass, move into the open space for a positional change. Don’t be in one line with your partner. Try to be positioned higher so you also open space for the side back. Move laterally into the middle or diagonally towards goal, if the side back on your side advances. When passing it forward, immediately look towards the middle. When passing it backwards, immediately look forward. If you pass it diagonally into the middle, advance on the side. If you played it vertically on the side, advance diagonally through the middle. When being on the ball or engaged in a combination, move into the middle. This creates an overload and chaos for the opponent while our shape allows us to cover this. Only move towards the middle when we have possession if you think we will lose the ball soon or your support in the middle is the only option to stay in possession. Otherwise stay wide. If your partner advances, fill in behind him and stay deeper if needed. Don’t be positioned in a horizontal line with you the left wing back besides you, your partner. Try to be higher. Keep at least 10 to 15 meters distance vertically to the holding midfielder behind you. If he drops deeper, you are allowed to drop a line deeper. If the other holding midfielder moves centrally, you don’t have to. You can move towards the sides to get a vertical pass from your wing back. He should move into the middle then; try to find him or the centre forward with a pass. If the central forward is on the right side, you can advance to occupy the last line. Look around before receiving; when you pass to the side, immediately look towards the middle and look for the other central midfielder. If you pass to the middle, look for the central forward and the wing back. Don’t be positioned in a horizontal line with you the left wing back besides you, your partner. Try to be deeper. If your partner drops, you should advance. If the side back on your side advances, move towards the middle or into the last line. If you pass it diagonally into the middle, advance on the side. If you played it vertically on the side, advance diagonally through the middle. Look around you; if there is open space and our team has no passing option, fill it and act as distributor. Keep about 15 meters distance vertically to the holding midfielder behind you. Imagine it as opening space for him! The oppositional players in the middle should always have to question themselves who to mark. This means only occasionally move into the last line so the centre back of the opponent won’t just start to mark you. If this happens, roam towards the side or slightly deeper. Don’t move towards the left side and don’t occupy the same spaces as the left central midfielder. Move towards the side where the ball is. Open space by moving towards the wing (opens gap between the centre backs of the opponent) or occupying their sweeper (if your man marker tracks you there which opens one side up). If they play with a back four, occupy the space behind their full back if he advances or the channel between full and centre back. Try to run horizontally towards the ball side and look for long balls behind their defense into space with abrupt vertical movements into gaps. If there is space open, you are allowed to drop but try to do lay offs and immediately turn and go into depth with speed again. If one of the central midfielders advances forward, you can drop deeper into the opened space to lose your marker. Before receiving, look around your shoulder. After passing, do that again. Try to find an open man for possible break through and so you can get through balls yourself. If we lose the ball, immediately press the ball. Run towards him in full speed! If you can’t reach it, still move towards the ball and cover for your team mates. If we lose the ball, don’t try to get to your nominal position; go to the nearest position in our system. Imagine our system as a net or chain; if someone moves out, we follow him and move towards the gap. Keep short distances and compactness (this should be focused in training sessions especially to really keep them consistently and so the players know which distances are meant). First focus on the ball, then on your team mate. If the opponent near you is not having the ball or being the next player who will get it, ignore him. Nice work. Is the book you mention, “„Fußball durch Fußball“ – Marco Henseling & Rene Maric” going to be translated into english? @ RM: Könntest du eine Übersetzung auch bei SV.de hochladen? Wäre sicher auch interessant für viele mit weniger Englischkenntnissen bzw. die SV.com nicht kennen. Do you think it’s plausible to base the majority of a team’s offensive play simply on playing in triangles, with position specific instructions in regards to who to build triangles with and when to build them? If you are able to give your Team proper Triggers for when to do what, and they understand the advantages of playing in triangles it should be possible. The problem for nonprofessionals is it takes a lot of time to get everyone in the team to do so, so it’s pretty unlikely to work on a low level. Hello! Great article. I was curious if your book “Fußball Durch Fußball” – has an English translated version. I would love to purchase it anyway possible. Please let me know. Thanks for all that you do. I was wondering the same thing. Make it happen Rene! Really great article, very helpful for starting coaches. I was wondering though, would you also play this system against a 4-3-3 or a 4-2-3-1? i find you very amazing ! Thank you so much, i’ve been looking for so many things about tactics, searching for good material and i find your work very useful ! i am a new fan of yours and it seems that i will continue to be.